10. Biotechnologies: The Ideal Victim? 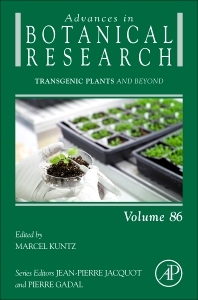 Transgenic Plants, Volume 86, the latest release in the series Advances in Botanical Research, brings together information needed by many teachers, researchers and managers who have to consider biotechnology from a scientific or legal point-of-view. It presents authors who bring their long personal experience on a given subject. Although the subjects are technical in nature, the take-home message of each chapter is understandable by non-specialists. Marcel Kuntz is a Director of research at Centre National de la Recherche Scientifique (CNRS) and also teaching at Université Grenoble-Alpes (France). His research as a plant biologist are conducted in the Laboratory of Plant Cellular Physiology, a joint laboratory of CNRS, University Grenoble-Alpes, Institut National de la Recherche Agronomique (INRA) and Commissariat à l’Energie Atomique et aux Energies Alternatives (CEA). He is studying the function of genes coding for chloroplast proteins and involved in resistance to stress.